“Is there any pattern in location-based, mobile check-in activities?” “If yes, is it possible to accurately predict the intention of a user’s next check-in, given his/her check-in history?” To answer these questions, we study and analyze probably the largest mobile check-in datasets, containing 20 millions check-in activities from 0.4 million users. We provide two observations: “work-n-relax” and “diurnal-n-nocturnal” showing that the intentions of users’ check-ins are strongly associated with time. Furthermore, the category of each check-in venue, which reveals users’ intentions, has structure and forms taxonomy. In this paper, we propose Hierarchical LSTM that takes both (a) check-in time and (b) taxonomy structure of venues from check-in sequences into consideration, providing accurate predictions on the category of a user’s next check-in location. Hierarchical LSTM also projects each category into an embedding space, providing a new representation with stronger semantic meanings. 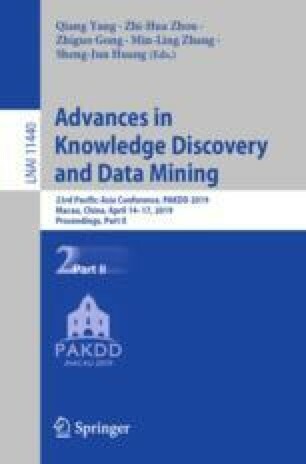 Experimental results are poised to demonstrate the effectiveness of the proposed Hierarchical LSTM: (a) Hierarchical LSTM improves Accuracy@5 by 4.22% on average, and (b) Hierarchical LSTM learns a better taxonomy embedding for clustering categories, which improves Silhouette Coefficient by 1.5X. D.-C. Juan, W. Wei, Y.-T. Chen and J.-Y. Pan—Recently working at Google, Mountain View, CA, USA.